With the holiday season and sunnier days approaching in the northern hemisphere, traffic inevitably increases on highways, in cities and around sightseeing spots. Additionally, a rising number of commuters contribute to growing nitrogen oxide and carbon dioxide emissions with adverse impacts on air quality and climate. By 2025, there will be approximately 1.5 billion cars on the roads worldwide. “This growing need for mobility creates challenges, but at the same time provides vast opportunities to develop innovative technologies that address these,” said Dr. Martin Brudermüller, Chairman of the Board of Executive Directors and Chief Technology Officer (CTO) of BASF. BASF, the world’s leading chemical supplier to the automotive industry, provides a wide range of automotive solutions such as mobile emission catalysts, coating systems, high-performance plastics and fuel additives. Since the development of the catalytic converter in 1973, catalytic technologies by BASF have eliminated over one billion tons of pollutants. BASF has been and will continue to be committed to improve air quality. The continuous development of advanced emission control technologies and increasing demand for electric powered cars will help reduce emissions and increase air quality on a global scale. Electromobility, especially in combination with renewable energy, is an important contribution towards addressing global mobility needs. Efficient, cost-effective storage of electrical energy in batteries will be critical to the commercial success of electric cars. It’s all about chemistry. Lithium-ion batteries are used in the majority of today’s electric vehicles. One of the most important components of these batteries are cathode active materials. They determine efficiency, reliability, costs, durability and the size of the battery. Their properties enable speed, acceleration and power – from compact cars to SUVs, from trucks to buses. “Cathode active materials by BASF make battery cells more powerful, more reliable and more affordable. They offer the biggest opportunities for improved performance at lower costs. This is the area where chemistry has the biggest lever for innovation and value generation,” Brudermüller further explained. BASF’s researchers are determined to bring cathode active materials to the next level of efficiency to support the ongoing evolution of e-mobility. It is about changing their chemical composition, morphology (form and structure) and production process. With its pivotal innovations, BASF aspires to deliver the highest energy density cathode active materials in the market. By 2025, these efforts will help to realize a vision of an electric midsize car with twice the real driving range (from 300 km to 600 km on a single charge) and battery lifetime, half the battery size and cost, and a charging time reduced to 15 minutes. BASF expects the market for lithium-ion batteries to grow rapidly. BASF’s battery materials portfolio includes Nickel Cobalt Aluminum Oxide (NCA) and Nickel Cobalt Manganese Oxide (NCM). BASF runs R&D sites around the world near its customers in Ludwigshafen, Germany; Beachwood, Ohio, U.S.; Shanghai, China as well as Amagasaki and Onoda, Japan. This proximity ensures a good understanding of customer expectations and market needs. BASF supplements its in-house capabilities by collaborating with leading scientists, start-ups and academia around the globe. 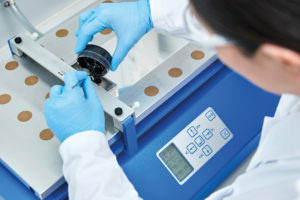 As part of BASF’s scientific network on electrochemistry and batteries, BASF is also involved in the development of novel and improved materials through its collaboration with the Karlsruhe Institute of Technology (KIT) and their jointly funded Battery and Electrochemistry Laboratory (BELLA). Along with academic institutions and private partners, BASF is engaged in numerous research projects that are partly publicly funded by the German Federal Ministry for Education and Research and the German Federal Ministry of Economics and Technology. BASF is a strong player in the battery materials market and runs pilot and production plants in all major regions: Ludwigshafen, Germany; Elyria and Beachwood, Ohio, U.S.; Battle Creek, Michigan, U.S.; and Onoda and Kitakyushu, Japan. BASF supplies cathode materials to platforms of leading automotive Original Equipment Manufacturers (OEMs) and is further growing its battery materials business. In 2017, BASF added production capacity in Asia, strengthened its footprint in the U.S. and announced its intention to add production capabilities in Europe. In North America, BASF and TODA KOGYO have established BASF Toda America LLC (BTA) which will produce and market high-energy NCM and NCA cathode materials in Elyria, Ohio, and Battle Creek, Michigan. This collaboration in North America allows BASF a strategic supply position and the production of innovative cathode materials to meet the needs of key global customers. In Japan, the collaboration between BASF and TODA KOGYO, BASF TODA Battery Materials LLC (BTBM), has expanded the capacity at its site in Onoda, Japan. BASF is launching a new communication campaign to celebrate its innovations in battery materials that help make electric vehicles a more economical and practical reality for everyone. To bring this optimistic vision of the future to life, BASF has created a visually spectacular mini documentary “Optimism in Motion”, starring a family living between Shanghai and Los Angeles, two of the world’s most congested cities. Find out more about BASF’s battery materials business here and have a look at BASF’s new film “ Optimism in Motion”.